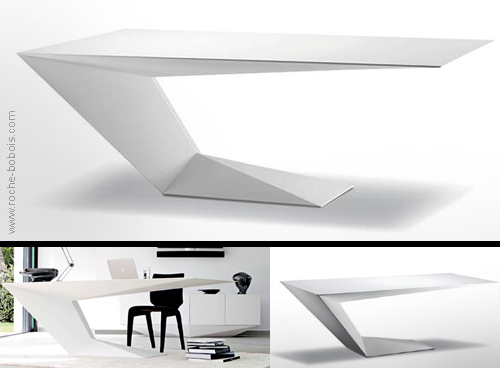 Like fighter aircraft designed to spoof radar detection, Furtif desk seem to defy gravity with it spectacular cantilevered design and futuristic prismatic volumes. As part of a Roche Bobois Furtif wide collection (that includes coffee table, buffet, console, side table,etc.) the desk frame is made in plywood and finished in solid or metallic lacquer or in veneered Alpi® grey oak finish. There is a matching filing cabinet with 3 drawers. Dimensions: 2200x 1100x 750 mm. 1750x 850x 750 mm. Yet another piece of office furniture designed for the MALE executive. I wouldn't sit behind it even in slacks. Hmmm.. A desk made for half of the species (in your opinion...). Really can't understand what is wrong with that? Aren't there things made for FEMALEs?? Many people find buying furniture online mysterious especially if they are not familiar with how these products are shipped and what to expect at the time of delivery.